Some of you may have read the above title and thought, “What on earth is oolong tea?” Well, it sits somewhere between black tea and green tea, because of the oxidation process. While black teas are fully oxidized (thus giving the leaves their characteristic black color), oolongs are only partially oxidized. As a result, their coloring is similar to black tea, but the taste more closely resembles green tea, with added complexity. So, if you want to avoid black tea’s caffeine jolt but crave more oomph than green tea can offer, you may want to give oolong a try. Which brings me to today’s tea, Da Yu Ling Oolong Tea from Yezi Tea. According to Yezi’s website, Da Yu Ling is the finest grade of oolong from Taiwan, and is grown at 7,500 feet above sea level. At this height, the leaves are exposed to drastic daytime-to-nighttime temperature changes as well as thick fog cover. By the time the leaves are harvested, they’ve had quite the workout. The resulting cup is smooth, fresh, and – in my opinion – deserving of Yezi’s high praise. Steeping Instructions: Use 1 tsp of tea for every 3 oz of water. Heat water to boiling (203 to 212 degrees Fahrenheit / 95 to 100 degrees Celsius) and steep for 45 seconds. Add 10 to 15 seconds for each subsequent brew. Oolongs are one of the most enjoyable teas to watch when brewing. With Da Yu Ling, the dark green leaves are curled tightly into tiny, crooked balls when dry. By tiny, I mean smaller than a button. As the tea brews, the leaves unfurl to reveal their full, beautiful almond shape about the size of your thumb. That’s huge, compared to other tea leaves! This visual surprise is one of the reasons why I love oolong tea. Also, oolongs have a distinct orchid fragrance compared to other teas. It’s lightly floral, with more exotic and regal hints than a typical floral or green tea. From there, the oolong scent spectrum expands, ranging from vegetal to sweet to slightly fruity. When dry, Da Yu Ling lies on the vegetal end; but when brewed, it exudes an enchanting mix of orchid, grass, and butter. I don’t detect the tangerine notes described by Yezi, yet the richness of Da Yu Ling’s bouquet is exactly what I look for from a good oolong. Apart from Teavana’s Monkey-Picked Oolong, Da Yu Ling Oolong is the first tea I’ve tried that the vendor recommends to steep multiple times. For the first cup, I brewed about 1½ teaspoons for 1 minute. The water turns a pretty pale gold, with a minty green tinge. Of course, there’s no mint whatsoever when you sip it. 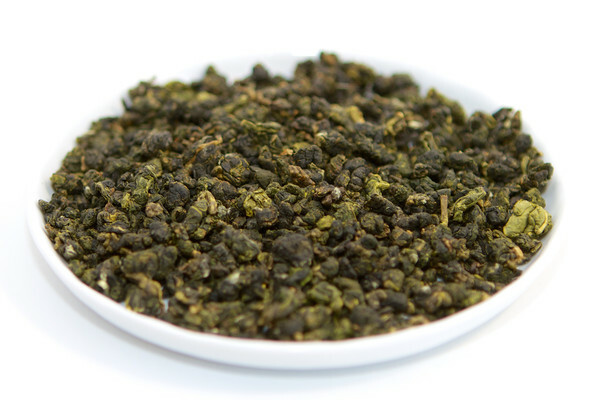 In fact, the first cup of Da Yu Ling tastes like green tea – fresh, grassy, natural. Maybe that shouldn’t surprise me, since the dry leaves gave off that scent. Yet it did. What makes Da Yu Ling a star is its additional steeps. The leaves release more flavor as the brew time increases. The steep I savored the most is at 90 seconds. Here, the liquid takes on a beautiful gold hue, and the orchid current starts to weave itself through. The tea also develops a smooth, buttery texture and a delightfully sweet finish. Whenever the 90-second brew is gone, my heart flops with disappointment because I enjoyed it so much – but then my mood flips to excitement, because the empty mug means I can make a new cup! I’d advise against brewing Da Yu Ling past 4 minutes, however. Beyond that point, a mild bitterness replaces the sweetness and eventually overpowers the floral notes. Most loose-leaf oolongs aren’t cheap. Da Yu Ling is up there, at $13.95 USD per ounce (or per 28.3 grams) – and a single ounce of dry tea goes quickly (7 or 8 cups maximum, not counting resteeps). Thus, Da Yu Ling is a bit of a dig into your wallet, but it’s delicious enough that it’s well worth the occasional splurge. Da Yu Ling has just about everything a tea aficionado could want from an oolong tea. The intricate mix of scents and flavors give this drink a majestic richness without compromising its freshness. The green-tea-like essence of the first brew threw me off a little, but the later steeps reassure that this is a true oolong. Also, I’m glad I chose Da Yu Ling as my first tea from Yezi. I relished this sample so much, and now I’m looking forward to the others even more than I was before! Possible Book Pairings: Somehow, oolong tea reminds me of Ursula K. Le Guin’s work. Try Da Yu Ling with The Left Hand of Darkness (science fiction), the Earthsea cycle (fantasy), or Lavinia (historical / mythological fiction). You can purchase Da Yu Ling Oolong Tea directly from Yezi Tea here.